Telecommunications giant Smart recently released a gay-themed advertisement that has earned praises from straight individuals and the LGBT community on social media. 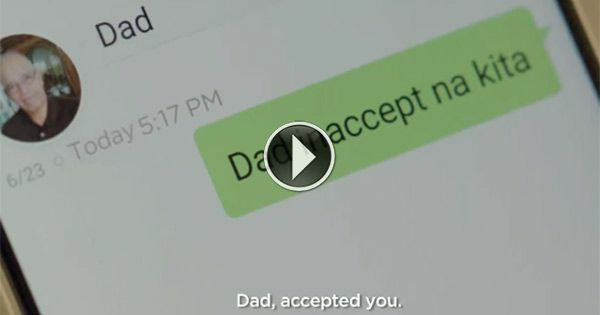 The ad features Kevin Silverio, a gay person who is having a hard time accepting his dad's Facebook friend request. What makes him hesitant is the fact that his account is loaded with photos of him and and his boyfriend and coming out might affect his relationship with his father, Manuel. During a family gathering, Kevin turns speechless when his dad asked why he has not yet connected with him on the social networking site. While alone in his room, Kevin tries to weigh in betweeen tapping the accept button and ignoring the friend request of the head of his family. "It takes courage to break down barriers. It takes strength to overcome differences. ‪#‎SmarterChange‬"